Americans overwhelmingly support teaching our children about the causes, consequences, and potential solutions to global warming – in all 50 states and 3,000+ counties across the nation, including Republican and Democratic strongholds. 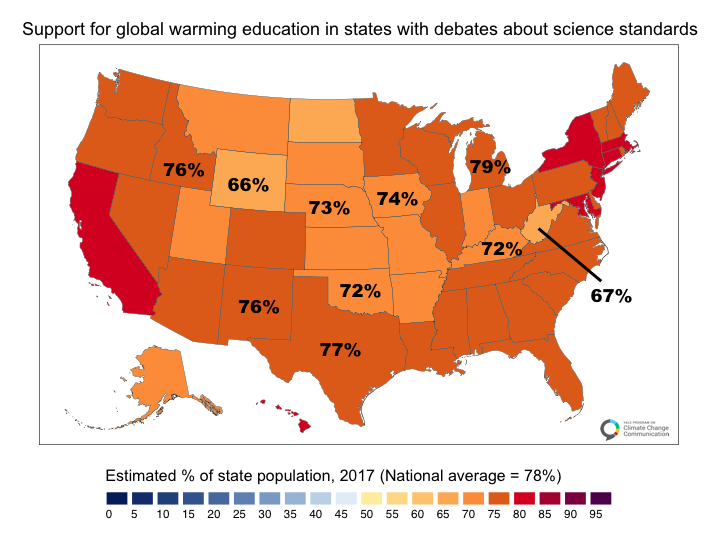 Despite this strong public support for climate education, there have been recent debates in several states about whether to include climate change in science education standards. These debates, fed by campaigns like the libertarian Heartland Institute’s recent mailing of lesson plans dismissing the scientific consensus that global warming is happening to teachers across the nation, indicate that classrooms are the latest battleground over climate change science. 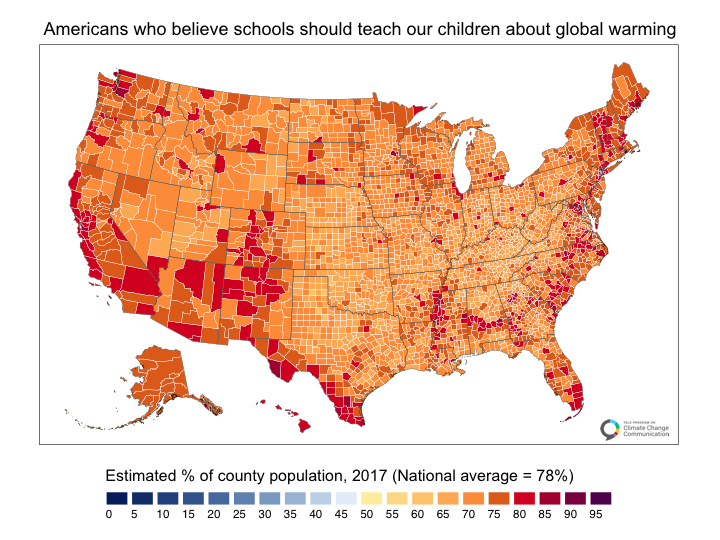 Question text: “Should schools teach our children about the causes, consequences, and potential solutions to global warming?” Map shows combined responses of “Somewhat agree” and “Strongly agree” based on the statistical model described in Howe et al., 2015. Total sample (n=6001) includes data from January 2010 (n=1001); March 2016 (n=1204); November 2016 (n=1226); June 2017 (n=1266); and October 2017 (n=1304). The most recent effort to remove passages about human-caused climate change from science standards came to a head in Idaho. Several Idaho legislators argued that students should not be taught that climate change is human-caused, but instead be given opposing arguments and allowed to decide for themselves. In response, teachers and citizens argued that failing to teach children the scientific facts about climate change would rob them of important information crucial not only to their scientific education, but also their future. After several years of debate, the state legislature finally approved science standards that include sections on human-caused climate change. The fact that climate change is happening and human-caused is not a matter of scientific debate: many studies have examined climate scientists’ conclusions about global warming and have found scientific agreement similar to the level of consensus that smoking causes cancer (i.e., above 95%). Idaho is not the only state that has recently debated its climate science standards. At least nine other states have debated their own education standards, many of which were motivated by efforts to exclude the teaching of climate change science. As depicted in the map below, however, a large majority of citizens supports climate change education in each of these states. Many teachers, however, need training and support to implement climate change science standards in their classrooms. Recent research published in Science found that many teachers are themselves not certain about climate change. For example, only 30% of middle school and 45% of high school science teachers understand the extent of the scientific consensus. Furthermore, of the educators who do teach climate change, many suggest the cause is ambiguous or uncertain to their students, while 30% actually incorrectly teach that global warming is naturally caused. Correcting the misperception about the scientific consensus that global warming is happening and human-caused is a key educational challenge for both teachers and students. Numerous groups support teachers with educational resources like the Climate Literacy and Energy Awareness Network, the Alliance for Climate Education, and the National Center for Science Education. Interested in more downscaled climate change opinions? Check out our Yale Climate Opinion Maps. If you’d like to know more about how these maps were created, please see our methodology. Cheskis, A., Marlon, A., Wang, X., Leiserowitz, A. (2018). Americans Support Teaching Children about Global Warming. Yale University. New Haven, CT: Yale Program on Climate Change Communication.